This is the first of several leadership drawings presented for consideration and discussion. Leadership is a very simple yet a very complicated action. The diagram below is designed to illustrate the many ingredients of the “recipe” for great leadership. Just as in cooking, it is the ways these ingredients blend together that create the unique character of the leader. Rather than pontificate on each facet, the point is to consider the diagram and invite observations about the leadership “recipe”. Note: It is dangerous to present one picture of leadership. The intent is not to present the “right answer” but to encourage meaningful discussion. As you peruse the drawing below, what are your observations? 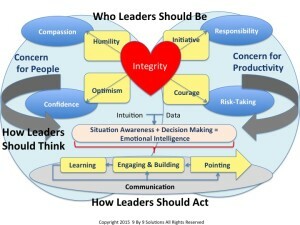 At the core of leadership is the central and mandatory trait – integrity. Without this trait, all other aspects of leadership are a façade that will eventually be uncovered. Integrity is the one pass-fail character trait: it is either present or it is not. If integrity is present it interacts with four other important core leadership traits: initiative, optimism, humility and courage. These traits will differ in terms of size and importance for each leader and that creates the distinctions between leaders (no cookie cutter for leaders). As these characteristics interact with integrity they combine to form additional valuable characteristics. For example integrity plus optimism produces confidence. Integrity provides the honesty to see a situation honestly and optimism provides the “can-do” attitude that creates confidence. Without the combination, a leader may see a situation clearly but the leader will lack belief in success. Additionally if leaders have integrity but no humility, they will have little compassion for others, as leaders believe that they are the main reason for success. Why Does It Matter? Rather than listing a hundred traits that leaders should posses, we should begin to look at how different core traits interrelate to form the necessary combinations. What observations or reactions do you have to the drawing?